In honor of my kids going back to school (YAY!!!! ), I threw together this cute little pencil block from scraps. It is based off a pattern from Accuquilt called Pencil Me In. They made it in six colors as a wall hanging. Of course, all the instructions call for using the GO! Qube cutting machine, which I don’t have, but it was easy enough to figure out what sizes to cut the fabric. My block of two pencils finished at 12.5 inches. Not sure what I’ll do with the block yet, so for now it will sit in a pile of unused blocks. Would make a cute start for a gift for a teacher! In between loads of laundry this week (three kids home from sleep-away camp! 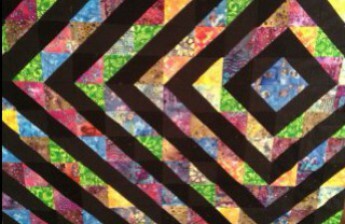 ), I managed to add the sashing to the Modern Block of the Month Quilt. It is now a finished quilt top- YAY!!!! I’m still in love with the Kona silver color. And the Tula Pink Freefall in battleship grey really is the perfect backing. But watch out for shrinkage (at least I hope that is what the problem is). The two yards I ordered wound up being only 67 inches after washing. I hadn’t thought to measure it before hand. Luckily, it was still more than enough, since this is a smaller quilt. I’m about half way through basting the quilt, and then I have to figure out how to quilt it. That part always makes me nervous! Sometimes quilts take on a life of their own. (No) Golden Shadows started as a square shadow quilt or throw pillow (I hadn’t yet made up my mind). When the shadows failed to show up at the appropriate spots, I just kind of winged it. There are no shadows to be seen in this quilt, which wound up with two-layered quilting in red and turquoise and an improvisational block style. At 36 x 68 inches, it is also an unusual shape for a quilt. Perhaps a table runner? I did find a beautiful rust colored fabric for the binding, which was machine stitched down. I also learned that you shouldn’t trim the batting all the way down to the quilt top, but rather should leave a good 1/4 inch. This will help with any misplaced binding stitches and will “puff up” the binding a little. Now that this is finished, it is time to turn my attention back to the BOM quilt.